If you are a professional athlete or working to be a more dedicated one, you subject your body to perhaps the most severe of punishments. You actively push your body to the limit during workouts, practices and the main events. You’re no stranger to back and knee pain, joint injuries, sprains, strains and other injuries. In severe cases, you or your comrades have even coped with frightening spinal injuries. The combination of a professional athlete and chiropractor is quickly becoming the “winning combination” throughout sports. Well-known and respected athletes with long, accomplished careers—including Michael Jordan, Tiger Woods, Joe Montana and Lance Armstrong—all attest to the benefits we discuss in this article. How can a chiropractor benefit you? They can help you gain a competitive edge. Improved performance. Numerous studies have shown an overall improvement in player performance for athletes under chiropractic care. Injuries tended to be less severe and recovery far less traumatic. It stands to reason that chiropractic care not only assists the recovery of injuries, but also helps prevent future catastrophic damage. Improved reaction time, range of motion and recovery time. High-impact sports—including football, wrestling and NASCAR—involve excessive g-force and exert a notable amount of strain on the spine. The result is often misaligned vertebrae. Nerve transmissions from the spinal cord can be disrupted, resulting in a limited range of motion, slower reaction time, headaches, painful inflammation and slowed recovery times. Athletes under regular chiropractic care have seen a noteworthy reduction in such unwanted deteriorations, reporting improvements in their reaction and recovery times and range of motion. One of the most notable benefits and primary goals of chiropractic care is injury prevention. As a professional athlete, one of your major concerns is not allowing an injury to slow you down. Your sport depends on staying fit, remaining active and ensuring injuries don’t end your athletic lifestyle or career prematurely. The benefits of chiropractic care are undeniable. Athletes staffing and following the instructions of a professional chiropractor gain a competitive edge through injury reduction, increased speed of healing and an improvement in overall performance. Grab our free report entitled, “Are You Heading Towards a Foot, Ankle or Knee Injury that Will Slow You Down? Learn How to Prevent It.” You can take advantage of this free offer to learn more about how to improve yourself in your sport. Whether you’re an athlete, avid runner, habitual gym goer or just trying to stay active, it goes without saying that feeling flexible and strong is important to you. In fact, it’s likely why you keep active. You want to enjoy your favorite physical activities. As we get older, minor injuries can be frightening and discouraging as we try to understand what the pain means and how to best treat it. Sprains occur when a ligament is torn; strains happen when a tendon or muscle tissue is torn. Minor sprains and strains can transpire when performing the simplest of tasks around the house, at the gym or on the job—especially if the affected area is not accustomed to the motion. The resulting knee, back, ankle or wrist pain can be intolerable. You’ll likely be unable to perform your usual daily activities until the injury begins to heal. Rest, get plenty of it. It’s important to rest the affected area or joint as this gives it time to heal without aggravating the tear. Endeavor to keep the area immobile, and avoid putting pressure on it. 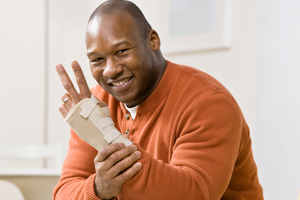 You will likely find the support of a sling helpful as the damaged tissue heals. Ice, put it on the affected area. If it all possible, ice the affected area as soon as the injury occurs. Ice will reduce swelling and inflammation. It’s important to continue icing the area during the first 24 hours following the injury. Afterwards, you can rotate between heat and ice to alleviate pain and keep any additional swelling down. Compression, use it to reduce pain and swelling. The worst part of any sprain or strain is the accompanying pain and swelling. It can be excruciating. Wrapping an Ace bandage around the injury can help. Be sure to wrap it snuggly, but not so tight that it restricts blood flow. Elevation, elevate the injured area. Elevation is another means of keeping unwanted and painful swelling down. Try keeping the injured area elevated for at least the first 24 hours, and continue to elevate as able afterwards. Restore and reestablish movement gradually. After a few days, the pain should subside. At this time, you’ll want to gently move the injured area. Your goal is to gradually restore flexibility and strength. Be careful not to overwork the injured area, otherwise you’ll risk further damage. In most cases, these five steps will remedy a minor sprain or strain within a few days or weeks, depending on severity. Anti-inflammatory medication can help reduce pain and swelling. Chiropractic treatments have also proven effective in reducing pain and increasing mobility. We provide a complimentary foot, ankle and knee pain consultation if you’re concerned about whether you have a sprain or strain and how serious it is. You can receive peace of mind by taking advantage of this offer. It’s important to treat minor sprains and strains with care. By carefully administering proper care and conditioning, you’ll be back to your active lifestyle in no time.